Missouri is replete with world-class attractions, but it also offers countless more intimate places for lovers to experience together. If you’re looking for a romantic spot for a first date, first kiss, or a proposal, a lovers’ getaway, or a full-fledged vacation with your sweetheart, Missouri offers a perfect location for every moment in your life as a couple. Looking for a romantic getaway? Try the Elms Resort and Spa in Excelsior Spring. Steeped in history, the Elms was a speakeasy in the 1920s, and Al Capone himself was a frequent visitor. Harry S. Truman waited to hear the election results while staying at the Elms in 1948. You and your companion will enjoy luxurious accommodations in an idyllic setting. Yes, the whole town! St. Charles is one of the oldest and most historical towns in the country, and it is so filled with charm, beauty, and tradition (its motto is “Welcoming visitors since 1769!”), that visitors make special trips just to walk hand in hand around this friendly, hospitable area. People plan destination weddings in St. Charles because the ambience of romance and welcome sets the tone for their new life. The town offers a walking tour down preserved brick roads, a trolley ride through town, B&Bs, boutiques and shops, arts and sports events, and wineries. There’s something for everyone, but especially lovers. Flowers are associated with love, and where better to spend time with your sweetheart than Missouri Botanical Garden, one of the oldest botanical garden in the United States and a National Historic Landmark? 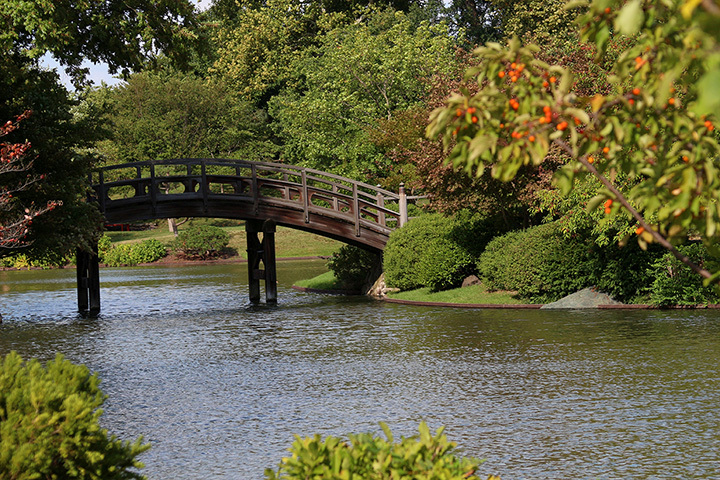 Take a turn in one of 12 gardens, including a Biblical garden (featuring plants mentioned in the Bible) and the largest Japanese garden in North America. Looking for a place to honeymoon? Consider this luxury inn set in the grandeur of a 19th century mansion. Consistently named the best bed and breakfast in St. Louis, the well-appointed setting includes a gourmet breakfast each morning, a spa room, and beautiful gardens. The Fleur-de-Lys can also accommodate small weddings. The Bridal Cave at Lake of the Ozarks takes its name from the Native American legend of a long-ago wedding between lovers from different tribes that took place right there in the cave. The cave is one of The Cave State’s most striking offerings, with rooms full of geological formations that took a century to explore and catalogue. One visitor described it perfectly—“It’s spooky-romantic, like a haunting love tale.” And in keeping with its reputation as a place for lovers, they also rent out some rooms in the cave for weddings! If you and your sweetheart love the great outdoors, spend a day hiking or canoeing Caney Creek and High Rock Mountain near Gainesville. Missouri has a multitude of inspiring vistas, but few can compare with the view from the top of High Rock Mountain, down over the wooded valley—and add in a sunset or a fall color scheme, there’s no more romantic spot for a first kiss or even a proposal. What could be more romantic than sharing a treehouse built for two? The treehouse cabins at River of Life Farm are in a secluded spot, deep in the Ozarks, with nine treetop hideaways to choose from. Each cabin is different, and includes amenities like hot tubs and fully equipped kitchens. If you’re looking for a place to be alone, consider a bungalow high atop the whispering pines. Hermann Hill Inn is set back in the lush wine country of east-central Missouri, the area known as “the Missouri Rhineland.” The Inn is actually a bed and breakfast, and the property also offers the option of the River Bluff Cottages—freestanding condo-like houses complete with hot tubs, a fireplace to snuggle in front of, and a full stock of cookies and ice cream. And of course, local wines are always available to enjoy on your romantic get-away or to take home to relive the memories. Warm colors, sensuous fabrics, and authentic Middle Eastern cuisine combine to make this Turkish restaurant a luxurious spot for lovers. Complete with a wide selection of wines and beers, and decadent desserts to delight the palate, Aya Sofia is one of Missouri’s most romantic restaurants. Every sense will be pampered in this lush, exotic setting. Celebrations Restaurant bills itself as “fine dining in a relaxed and elegant atmosphere.” The building, a former home dating back to the 1850s, provides quiet dining rooms and cozy corners, just right for a meal with your sweetie. Weather permitting, you can also dine under the stars in the courtyard. Perfect for date nights, honeymoons, and just getting acquainted. Something about water soothes and comforts us, and that’s even more true when we share it with someone we love. Stonewater Cove on Table Rock Lake takes advantage of its stunning natural location, and adds to its luxury, privacy, and the hospitality of a family-owned resort. When you add the in-house adventure offerings, and access to Branson and other regional destinations, this will be a vacation you and your sweetheart will never forget. The Raphael is one of Kansas City’s premier hotels, just steps away from the famous Country Club Plaza. Perfect for honeymoons, anniversaries, or any special occasion, the Raphael even offers a “romance package,” complete with champagne, flowers, and a two-person whirlpool in your room. You can even request rose petals when your bed is turned down for the night. Come on out and relax on the Meramec River in Jack’s Little Log Cabin. Cozy front porch, private bedroom with queen-sized bed, even a hot tub. You and your honey can get back to basics in the shade of the tall pines, or take a trip into nearby St. James for some wine tasting. Check out Ellen’s Little Log Cabin, too, located a short distance away! Garth Mansion is an historic Victorian estate in which Mark Twain himself stayed. You and your honey can relax in a sumptuous bedroom in the house, or rent a small cottage on the grounds, secluded from the noises of nearby Hannibal. Breakfast in the morning, sightseeing during the day, and a drink from the bar in the evening: Garth Mansion has everything you need to make this a romantic getaway.